Below are 20 grey squares on a black background. 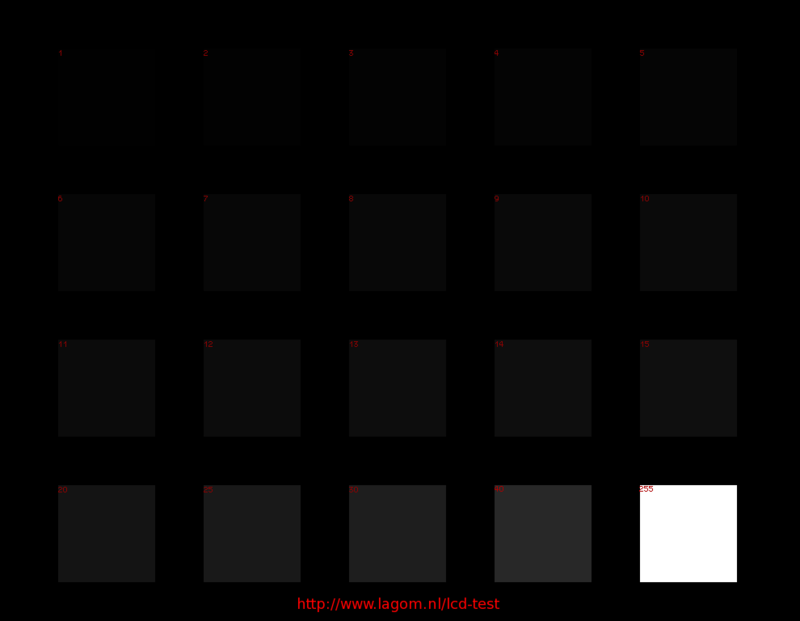 On an ideal monitor, all of them should be distinguishable, even the very dark first row of squares. Of course, the black background should be as dark as possible. The square labeled '255' is the brightest possible value, which can help to subjectively judge the contrast ratio. As with the gradient test, you might see noisy dithering (see below). For this test it is essential that the environment is dark and that the browser or image viewer is running in full-screen mode. Use the contrast setting, and maybe gamma to improve the display of the darker squares, but watch out for undoing the optimizations in the earlier images. On most LCD monitors, the brightness setting only affects the backlight, but doesn't affect the test images otherwise. On many LCD monitors, the darker shades show up as dynamic or static dithered patterns. Temporal dithering, frame-rate control (FRC), or dynamic dithering look like quickly moving patterns, similar to the one below. Make sure that you did not disable GIF animation in your web browser. The effect has been exaggerated to clarify the principle. Many monitors cannot make small brightness steps, especially in the darker shades. Instead, they rapidly alternate between darker and brighter shades for the individual pixels, such that at least on average the brightness is correct. In older and/or low-end monitors, the dithering pattern may not look like noise, but rather like regular patterns as in the image on the right. The bottom right corner is zoomed in, the rest is at true resolution but again exaggerated for clarity. Older LCD monitors and many laptop screens do not do temporal dithering at all, but rather static dithering, i.e. 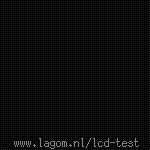 they use a fixed pattern of darker and lighter pixels, such as shown here. A disadvantage of static dithering is that it typically allows 253 shades in each R, G, and B component, rather than the 256 shades that correspond to 8 bits. This is also the case with simpler dynamic dither algorithms. The number 253 originates from a 6-bit (64 shades) display driver that interpolates in 4 steps per shade, which gives 63×4 + 1 = 253 shades. Such displays are sometimes specified as having 16.2 million colors (2533), as compared to 16.78 million colors (2563). Usually it means that the darkest four shades (0, 1, 2, 3) all are displayed as black regardless of the monitor settings. 6 bit or 8 bit? There appears to be a lot of discussion among tech enthusiasts on web forums about whether a particular monitor is 6 or 8 bits. I believe that this question is as meaningful as asking whether it needs 115 or 230 volts. For the one who designs the monitor, this is a relevant question. However, what matters for you, the user, is whether the monitor can display all 256 shades without disturbing amounts of visible dithering. How much you notice dithering is a combination of factors such the response time of the monitor, how intelligent the dithering algorithm is, the voltage response curve of the LCD pixels, and finally the number of bits. These are the theoretically possible dithering schemes. I do not know which ones are actually commonly used. The first two schemes are fairly easy to recognize with the naked eye, but for the other ones, you would need to know what electronics is inside to be sure.